This weekend, I will be in Columbus, OH for the Origins Game Fair. I am both excited and nervous about this trip. I’m excited because I get to see a bunch of friends that I only get to see a few times a year…. but also because I have meetings scheduled with publishers. I’m nervous because I have meetings with publishers. Recently I wrote an article about setting up these meetings. It really is easy to get these meetings set up. I have no anxiety or stress about cold calling publishers and asking them for a chunk of their time… delivering something presentable and not making a fool of myself once the meeting is underway is a totally different problem. So, I practice. Usually by myself, but sometimes to others, I go through the routine of showing off my games. I perfected the Scallywags pitch through many game days and conventions of teaching strangers the game and trying to pique their interest as fast as possible. I want to be able to do that with my prototypes, but until I actually get in front of people with the game, it’s a hard. So I practice. I record myself and listen back to it. I try to hone the presentation as much as possible. I write down questions I might ask myself and try to prepare answers. I don’t want to go into these meetings with a script in hand, but I also don’t want to be fumbling for words. Sometimes, this practice is custom tailored for the publisher. One meeting I have scheduled is to snow Black Bear Downs. The publisher is interested in the mechanics of the game, but “I can’t do it as horses, and that’s the only types of races that people bet on.” Good thing this game is about mechanical greyhounds! I know that argument won’t fly, so I have been custom tailoring this pitch with a backup theme. I have been practicing all week how to pitch this game with my new theme and honestly, I’m really excited about it. I hope to have good news next week. No matter how much you practice, you are still going to fumble, and that’s okay. That is part of being human. Publishers aren’t going to pass on your game because you were nervous. Just be you and remember my tip from my pitch article: sell yourself, not the game! Forming a lasting relationship with publishers is way more valuable than walking away with a contract in hand. I have recently tried to cram six months of development on Hedeby into two weeks of intense sessions. Last night, we tested the new version again and I must say, it’s been worth it. I will be showing this game at Origins, but I did not inform any of the publishers I am meeting with about it… mostly because I didn’t think it would be ready. I could develop on this game for years to come. There is so much I can tweak, but I don’t want to do that anymore. I’m not saying things won’t change, but I am going to start getting publisher feedback to help me with tuning the game… and who knows, it may find a home before I decide I’m done with it. In my last post, I discussed briefly that I cut out the Worker deck, changed the dice, and introduced a secondary currency, but I didn’t explain that much. That’s because I was a bit unsure about the changes. I am totally confident in those decisions now. I always wanted a secondary currency in the game but I struggled with how to implement it. I wanted something that you could spend for secondary abilities and also something that you could exchange for unused goods. Silver is that answer. It can be spent on Ships, which provide special abilities, but it can also be used to activate some other card abilities. Implementing Silver was the difficult part, but it became significantly easier when I implemented the next change. I decided that six different types of goods was just too many. It was difficult to determine what you could do with your rolls each turn when you had six different numbers on everything. I decided to cut things down to only four goods, which freed up a few faces on each dice… for Silver! Now that the dice did different things, I would have to make custom dice. As long as I was going down that road, I decided to experiment a bit. There are ten total dice and all of them have one face for each of the four goods. 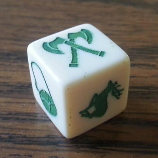 Seven of the dice have two Silver faces while the remaining three dice have one Silver face and one Raid face. Raids are wild. You can use them for a good or take silver for them. The Raid symbol gives you a really flexible option occasionally and also a small press your luck type element when you really need something and decide to re-roll. So far, these changes made the flow of the game better, but they didn’t really do much about the length of the game until the next big change. This change had the most significant impact on the game in many different ways. Originally, you rolled the dice, spent them to acquire worker cards, which did nothing by themselves. You kept a hand of worker cards and you could then spend them to buy buildings. There were about 12 building options and they were always available for purchase by all players. This system worked fine, but when I started cutting the costs of the buildings to decrease the length of the game, it became apparent that the worker cards were no longer needed. The change was to shuffle up the buildings into a deck and now you are using the dice to purchase the buildings directly. This dramatically improved the game and shortened play time. Now, almost every turn you are able to buy something that improves your position in the game by giving you special abilities. You don’t have to spend multiple turns saving up cards in your hand to buy something good. This change was not without problems however. Without the middle currency, I severely cut-down on the number of abilities I could have in the game. Drawing a card off the top of the deck, for instance, was no longer something I could use because it became extremely powerful. So, the next change needed to happen. Now that everything was clicking the way I wanted it, I needed to introduce a way to spend money as well as introduce a few static abilities into the game. One of the staple buildings from the old version was gaining extra dice each turn. In a deck full of random buildings, I found that it may not come out that often. I really wanted that ability to be more prevalent, so I needed to remove it from the deck. I also wanted a way to transform goods into silver and silver into goods so that you would always have something to do on your turn with your excess goods and/or silver. I placed these abilities on ships. 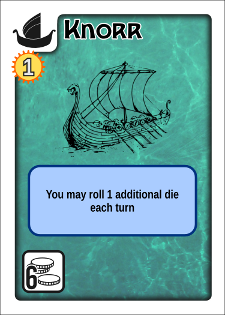 Ships were the staple for Viking trading and I always wanted them in the game some how, I just didn’t know how. This method gave me a way to get them in, while also giving you some static abilities that are always available. They are also purchased with silver only, which means you have something to do with all that money you are earning each turn. At our last test session, ships were a cornerstone of everyone’s strategy and it was perfect. Exactly what I wanted. That’s enough detail for now. I have a lot of work to do to get the game ready for Saturday and I’m running out of time. 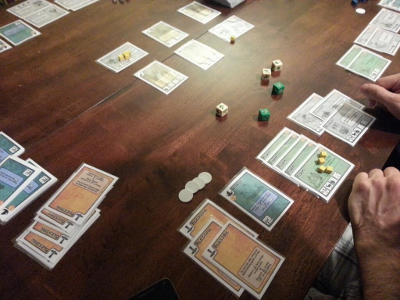 After our last test, there is a few tweaks that need to happen before I unleash this game on publishers. Depending on how the game is received on Saturday, I might be sharing files soon!